Are QR Codes Ready for Their Close-Up? QR codes are still waiting for their break-out moment. But the 2D barcodes, which trigger URLs or information when scanned, continue to gather quiet momentum that could finally tap into the potential of the technology. Today, Big in Japan, the company behind the ShopSavvy barcode scanner app, announced Ford (s f), Gold’s Gym and the Washington Metro are testing QR codes through the Scan with ShopSavvy program. The program allows companies to brand their QR codes with ShopSavvy’s name so ShopSavvy’s 6.5 million users know they can use their scanner app to read the code. That should raise awareness about the codes and help people understand what to do with them, which is a major problem. Last week, eBay-owned (s ebay) RedLaser added support for QR code scanning, bringing the function to its mobile app, which has been downloaded 5 million times. RedLaser is best known for enabling people to pull up information on products by allowing them to scan their barcodes. The new QR code feature can also be implemented by dozens of developers who are using RedLaser’s latest SDK to integrate scanning into their apps. With its large following, RedLaser should cause more people to scan the codes to extract not just product information, but all kinds of online data. Earlier this month, online social stationery printing service Paperspring launched Paperlinks, which allows users to order invitations, cards and announcements that include QR codes, that can link back to a custom site with photos, videos and event information. This may not appeal to everyone, but it shows how traditional print products can incorporate QR codes. Last month, Google (s goog) formally released its URL shortener Goo.gl, which included the ability to create QR codes by adding “.qr” to the end of a shortened URL. Bit.ly followed up last week with a similar feature, allowing users to create QR codes that lead back to a link. Google has already been pushing the codes as a way to download Android apps. It also launched Favorite Places on Google, which involved distributing 100,000 QR code stickers to local businesses. The shortener tools are a simple way to make QR codes and could help ease adoption, by making people not just scanners but creators of QR codes. In August, Spanish mobile marketing company Macanudos showed off the ability to create QR codes that trigger a Facebook “like” for an object or a place. The codes could be placed on stickers, posters or in print. This is more of a marketing play for businesses, but it shows some of power of QR codes to bridge the physical and the online worlds. This still isn’t a definitive turning point for QR codes, which have been waiting for their time to shine for a while now and will likely take a while to mature. But the technology is coming together to create awareness around something that’s been rarely used outside of early adopters. The process of scanning is actually quite easy; it’s just we haven’t had many reasons to use them on QR codes. With these latest announcements, we may see the light at the end of this tunnel. The biggest thing in the near future will be the integration of QR codes into catalogs. Think about it: Each item in a catalog can offer its own support website that lists all kinds of information about it, or even leads to similar products via links. I also think that eventually you’ll see a lot of them on the backs of books. One click of the camera and the user will see all books that the author has written, along with the associated Amazon link. Some people commented and asked “What’s in it for the user?” I totally agree when I’m not getting anything out of it. BUT, check this website out http://www.uqr.me It’s the first social utility for QRs! What do you guys think? I think it’s definitely a useful tool. Agree with Melody. There has to be something in it for the user. Context is king and people will be using these on the run. So they have to offer something compelling. Your reference to the QR to “Like” from a Spanish company is being replicated by others and is being used in a Nike/Europe campaign right now. It is the dumbest use of a QR Tag, perhaps ever. Why in the world would I take a minute or two out of my day to scan a QR Tag that gives me nothing and triggers a “Like” function that I did not even know about or approve. This kind of reporting where “all things Facebook” are glorified is fairly repulsive. Truly, #gigaom has been taking a dive when it comes to credible reporting for the past few months. Part of the problem has been that the QR campaigns, to date, have been either poorly executed or have failed to really tap into what is unique about mobile engagement (context, location, time, attention, etc.). Campaigns have delivered videos when people are in a store and have not time (or audio) ability to appreciate them. Or, they’ve delivered complex mobile web pages. Or, worse, they’ve delivered nothing or close to it. A QR/Mobile engagement takes at least one, likely two, minutes of someone’s time – exclusive time. The reason Microsoft’s ALLURE MAG campaign has the highest numbers is that there was some real money at the end of the QR Tag (contests and give aways). Some of us remember the early days of YouTube, when it was in it’s infancy, and 100,000 views seemed like a lot. Then, something went “viral,” and the rest is history. If you provide the right content, either in terms of entertainment value or monetary value at the end of a QR tag, you’ll see the same thing. There are differing opinions on this subject that get quite heated. Yes, there is a growing push from the Industry side, yet, the top QR scan # campaign remains the DROID campaign topping out at around 175,000 scans. Peanuts. Here are the real issues: Microsoft Tag’s proprietary 2D format just announced their cumulative ALLURE campaign scan rate, with multiple Tags, around 450,000. Non-Reader formats like JagTag have hit 125,000. Still, peanuts. QR, by virtue of it’s semi-open source nature, is fragmenting. Some readers won’t read some codes. Some companies are creating proprietary QR/App readers or trying to re-brand QR in a way that only confuses the public. It’s kind of the Android of the image detection world. Where, weirdly, Microsoft Tag is the iPhone of the world(user satisfaction and no confusion). Let’s face it, QR/2D and even JagTag or text detection technologies are pretty old at this point. My bet is on QR being overshadowed by Goggles and perhaps even Microsoft Tag. Goggles will become the defacto device on Android (and, there’s already an iPhone version where it will be embraced); Microsoft now have Windows-Mobile. 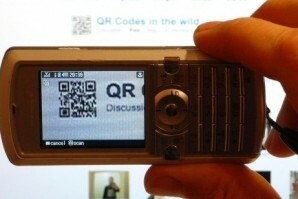 Maybe Symbian will get QR (and be pleased with a continued diet of peanuts)? Thanks for the balanced reporting — there’s been so much negativity about barcodes lately, from the “why hasn’t it exploded yet” crowd. We are adding robust support for QR in our product. You can schedule an appointment with the business just by scanning the QR tag (and click on “Like” if you truly want to).